There were quite some reactions on lasts week’s post converting plots to data. Two additional programs were mentioned; WebPlotDigitzier and DataThief. Note that google or wikipedia has a bunch of alternatives. Datathief is shareware, a java program, so can run on Mac, Windows and Linux. WebPlotDigitizer is, as one might guess, web based. Since these two were mentioned, I thought to try them. DataThief works well. It is shareware, let me wait for 6 seconds before running. I found the axis definition non intuitive, the points are basically on the screen, you just have to shift them to the correct locations. It is just with the high resolution figure they were all top left. Then with the low resolution figure they were outside my screen. The points you want to add you drag from a small floating menu to the correct location. Or shift again if you are not right at once. You want to delete them, drag them back. That is, if you switch on the data dump menu item. 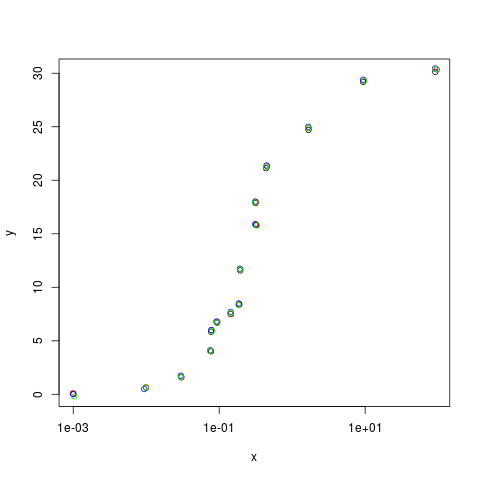 For importing the data in R, I found it most easy to remove the top line from the .csv. For practical usage, it is close to PlotDigitizer which I examined last week. I found it again easy to use. Define axis, add points, remove points. Export to .csv. A zoom window so you can see in detail where you are. It has an auto mode which I like, but have to conclude that my current figure is not suitable. In a corporate world web based is a winning thing. IT and self installed software is a no go area. Web based avoids the problem. I do not know if that extends to IE6. There is a Chrome app, which should work. I used Firefox, which does work. If I need to digitize a plot at the office, WebPlotDigitizer will be my tool of choice. Results will very much depend on the precision with which axis are defined, which can cause a bias. From practical point of view, when I combined all data, they were all on top of each other. The plot below has all four sets, using red, green, blue and black. Except for top-right, where quite of top of each other. Obviously as one comment stated, if the original plot contains an error, so does any extraction.